I bought the normal type. I think it’s good if you’re only looking for curls in a mascara primer, but I ask for curls, volume, longer lashes... a lot in a primer, so it wasn’t enough for me. 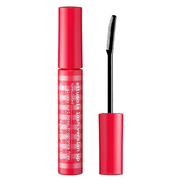 It has a comb applicator that separates the lashes from the roots beautifully, so it creates a nice base for your mascara easily without fibers clumping up. It makes me think if you have naturally great lashes, you’re ok with wearing only this. It contains fiber so it elongates the lashes too, but it actually doesn’t feel like there’s much fiber in it, and it doesn’t make my lashes longer. On the other hand, this seems like you won’t have problems wearing contact lenses, so I felt that it is good for those who don’t like mascaras with chunks of fiber. When you apply this thoroughly from the roots, it does curl the lashes pretty well. I have heavy monolids, so they do start to sag down in the evening. If you have double-eyelids, I don’t think you’ll have my problem. It doesn’t give volume, so it creates a delicate finish. You can use a volumizing mascara on the upper lashes, but I felt that the curls won’t hold if I gave too much volume, so in the end, I felt that this is more geared toward people who only want their lashes curled up. I don’t think this is a bad product; it just wasn’t for me. I’m using this on days when I wear glasses since it doesn’t elongate my lashes. I also have KATE’s mascara primer, but I prefer ettusais. The big difference was the size and shade of the fiber. Ettusais is black, while KATE is white. Ettusais has finer fiber, where as KATE’s is larger. One downside with KATE’s product is that the fiber is large and it tends to clump up. Also, it stays white if there’re parts where you couldn’t apply enough. Ettusais has a comb applicator which prevents clumping, and it’s also nice that the fiber is black. If you want more volume, I would definitely go with KATE though. On my downward pointing lashes, nothing keeps them up, even with a curler. I asked my friend for some advice, and she gave me this. With this and a mascara (different brand), my lashes have started to stay up all day, so I haven't had to re-do them! I can probably only do my stubborn lashes with this lol. I will buy some more when I run out. Since lashes point the wrong way, I give my lashes a good curl in the morning, but they always went back by evening. I tried a lot of solutions, and bought a lot of different products. This is good! Really pretty good. I didn't think it would be that much of a different with just a base. After using a lash curler, I use this base, and it keeps my lashes lifted and separated. They stay curled that way, and with the mascara, that curl lasts a long time. My lashes always start drooping halfway through the day, but not with this! I've decided to continue using it.